Chinese herbal therapy is the main therapy in the Traditional Chinese Medicine (TCM). It uses medical herbs for treatment, though it actually also using animal parts or mineral stones sometimes. The herbs are mostly from pieces of the plant parts, such as leaves, balks, roots, or flowers. The herbs usually need different treatment, such as drying, frying, powdering, rinsing with some liquid or juice (such as ginger juice or honey), before use. The herb used can be single ingredient, but mostly a mixture of more than four ingredients. Sometimes, a herbal formula may contain more than 20 ingredients. 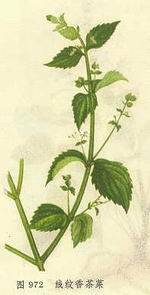 The herbs may be used in the form of powder, pill, tablets, but traditionally it is used as water cooked “herbal tea”. The choice of the herbal form could influence the healing effects. Chinese herbal therapy has been used in history for thousands of years. In the first book, Shan Hai Jing, the herbs recorded are only 124 kinds. Now, it is 12772 kinds. Most herbs are collected from China, and some small amount, from other countries. Most of the herbs have to be cooked in water to get its water extracts. Patients then drink the herbal tea. Now most of them can be precooked, then made into powder. Patients need only to re-dissolve them into water to drink. Or they are made into pills, tablets. Some are made into infusion form for vein infusion. In Chinese herbalogy, our daily eating foods and beverage can also be used as herbs. Rice, wheat, meat, beans, and also salt, vinegar, wine, sugar, pepper….. have different effects on our body functions, so be used in the clinic treatment too. For more than thousands of years, Chinese already realize that the pharmartheutical property of different parts, such as from leaves, barks, roots, or flowers of a plant could have different healing effects. Also, processing of the herbs could also change their healing effects or possible side-effect-inducing ability. Most of the herbs may be processed by frying, drying, cooking with fresh ginger or honey, or steaming, and so on. By this way, the healing effect could be strengthened while the side effects by them be reduced. This is one of the way to prevent side effects of Chinese herbs. The old time Chinese also know that the same kinds of herbs may have different healing property, if they are collected from different seasons, years, from different geographic locations or from different age of the plants. This variation of herbal quality affects the clinic use somehow. Therefore the evaluation of the quality of herbs has been a specific knowledge and expertise area of the herbalists. Because the Traditional Chinese Medicine focuses on clinic syndrome, a syndrome defined by the TCM can be seen in many kinds of “diseases” defined by western medicine system. For this reason, a given herbal formula may be used in largely various clinic “diseases”, no matter if the diseases are caused by foreign invaders, like bacteria or virus, or by exposure to extreme physical or chemical influence, like the exposure to the cold weather, or by inhale of chemical vapor, or intake of chemical western medicine drugs. Different TCM syndrome is caused by different reasons. However, the TCM does not pay much attention to if the syndrome is caused by bacteria or virus, or which kinds of bacteria or virus. It pays much attention to if it is caused by inside or outside reasons, and if the causing factor is with the nature of Fire, Wetness, Cold, Wind, or Dryness. This can be told by the clinic manifestation of the patients. For instance, if the disease causing factor is in Fire nature, the patients show fever, dry mouth, yellow urine, mucus ulcer, bleeding, constipation or even coma. If it is caused by Wetness, the patients show heaviness in head, arms, legs, tiredness, lose of appetite, nausea or loss bowel movement. Once it is known the nature of the causing factor, the TCM doctors will use corresponding herbs to expel or eliminate the cause. With the progress of a disease, the body condition could change too. Long term disease exhausts body’s defense system, makes patient weakness, with stagnation of blood and vital energy flow in the body, and cause more clinic troubles. So, the herbal formula should be changed according to the change of the body condition as well. Such a nature of Chinese herbal therapy makes its use much more individual to each patient and in each stage of a disease. But it is very useful in the prevention and treatment of acute epidemiologic diseases, especially when the pathological cause in remain unknown, such as in a situation of SARS in Asia in 2005, at which time the conventional medical system does not know how to prevent and how to treat the patients. Under strong influence of conventional medicine, in which an “active” ingredient is expected to work in an herb or an herbal formula, much effort has been paid in last 30 to 50 years to seek such active ingredient, with the dream that the active ingredient can be synthesized in a lab or largely produced in a company. By this, human can escape from the control of the nature to produce enough herbs for use and we may use small amount of the active ingredient for the treatment with higher clinic efficiency. This has been dreamed one of the major way to modern the traditional Chinese herbal therapy. (a). It is hard to find an so called active ingredient in many formula. It is no strange to know this, since herbs, once cooked, could extract hundreds or more than thousands of chemicals from the herbs. The amount of the expected active ingredient may be the same as, or even smaller than, the most of other ingredients in the herbs. So, it is difficult to isolate it from the complex. (b). In some cases, the researchers did find and isolated an “active” ingredient. But, once used in clinic, it shows lots of unexpected side effect, though it may show similar or better healing effect, compared with the original formula. A quite safe Chinese herbs therapy becomes typical conventional medicine with unexpected side effects. To us, we no longer regards the isolated ingredient as Chinese herbs. The researchers cannot understand that Chinese herbs work as a unite, an team, as an army in a war. Each herb in a formula has its own effect in the whole formula to make it works without, or with very limited, side effect. Some ingredient work in this aspect, and others in another aspects, to correct the disorders of the body function. That a single hero could save the world does not apply to the Chinese herbal therapy. Chinese Medicine understands and explains the illness in body as the phenomenon in the nature. In the same way, it is to create a season in the body to correct the illness. For example, if one feels cold in hands and feet, prefers to dress lots, to drink warm water and his/her face shows pale, tongue is also pale with little thin white tongue covering, and his/her pulse feels weak, we say that the one has Yang weakness, a condition similar to a winter. The herbs to use will work to warm up his/her body, e.g. to create a summer in his/her body. Similarly, if the body is under a “summer” season, such as high fever, extreme dry in mouth, constipation, very yellow urine, bleeding… a situation usually found in the middle stage of epidemiologic disease, such as Japanese encephalitis or some acute inflammation, such as acute neumonia, we will use herbs to create a “winter” in the body of the patient. For people with high fever, we may also use some herbs to let the patient sweat. Sweat can be understand here as “rain” in nature. Under rain, can you fell hot again? The sweating therapy can also be used in the treatment of urine retention. Urine (water) in the uring bladder can not excreted out through the urine duct, it can be removed from the skin. You can find many of such therapies in Chinese herbal therapy, which mimic the phenomenon in nature for the treatment of illness in human body. The main principle to use the herbs remains the same as thousands of years ago. Herbs have to be used and formulated according to their taste and dynamic nature to a disease. The dynamic nature means it, once comes into the body, has Lifting, Settling, Expanding, or Contracting effects. Different taste and dynamic nature bear different healing effects. Because the TCM is based on the clinic syndrome, any change in the syndrome during the treatment needs modification of the herb formula, so the side effects of the herbal therapy will be corrected before it causes any more or permanent problems (side effects). This is far different from conventional medicine, in which a side effect may last for a long time. This is because the medical drugs have to be used for a long time. For instance, many pain killers cause constipation. Before we find the cure for the reasons that cause the pain, the pain killer has to be used continuously. The conventional doctor has to use additional medicine to correct the constipation. If at the same time the patient loses appetite, he/she has to give second additional drugs to improve the appetite. Some time, the side effect may be not so easy to correct and lasts as a life long problem, such as the deafness caused by the use of Chloramphenicol in children. It is emphasized in the TCM that nothing should be taken too much to be taken into the body. This includes sugar, salt, water, not to speak of the herbs. Nothing in the nature is “the more, the better”. One wants to avoid too much disaster, but too much easiness in life is neither a good thing to him. Any herb is the tool in the hands of the TCM doctor, just as any drug in the hands of conventional medicine doctor. Use the herbs or drugs in a proper way will reach the aim of healing. Otherwise, both may cause side effects, temporally or permanently. The difference between the two medical systems are: the way of the TCM allows it correct the side effect soon without affecting the main goal of the treatment, but the conventional medicine, in most case, have stick to the treatment for a long time. Because the use of Chinese herbal therapy is based on the Yin-and-Yang theory and the Five-element theory, a given clinic disease (syndrome) can be corrected by quite different ways. Readers can image: if you want to lift something up, you can pull it from its top, you can also push/hold it up from its bottom. Correct? In Chinese herbal medicine, there are much more choices to build up the herbal formula for the treatment, due to the rich mutual relationship between the Five Element. For example, if one has Liver Fire syndrome (Zhen), the one feels bloating in the area of his/stomach, liver and spleen. The one also feels bitter in mouth and is very irritable in emotion. For this one, Chinese medicine may use the herbs that works directly on the Liver system, but we may also use herbs that works on the Kidney system, Heart system, of even the Lung system too. Different doctor may use different formula for the same patient. Some doctor takes the way to solve the problem in a short term, but others may choose to remove the cause of the syndrome in another way. The Chinese herbal therapy just likes an art in the hands of doctor. In Chinese history, some famous doctor may use only one formula for most of his patients with only little bit modifications when used to individual patient. Many times a difficult case may be cured by a doctor using a herb that normally not used by most doctor in such clinic case. It is surprising but it still follows the basic rule of the guide of the TCM bible. If we want to test and tell if the Chinese herbal medicine works or not, we should use it its own way. Other wise, conventional medicine drugs could also be garbage if we use it in a way as Chinese herbs! After 20 to 50 years of trying to combine the TCM with the conventional medicine, many conventional medicine doctors learned the function of some TCM herb formula. They know which herb are used for which clinic “diseases”. Therefore, along with their prescription of conventional drugs, they also prescribe such herbs that supposed to use in such diseases. On surface, it seems expanded the use of the Chinese herbal therapy, but it actually damaged the TCM: once the herb is used in a way as conventional medicine, it is no longer a TCM herb, in terms of side effects. The herb should match the clinic syndrome, not the disease! As we mentioned above that the Chinese herbal therapy is for clinic syndrome, not the disease. Forgotten this natural difference, one can hardly use the herbs as they are supposed to, neither the clinic effect they supposed to show. If so, how can we say that the TCM herbs don’t work? If a foot soldier drove jet fighter, he said that the jet fighter is no use in a war compare with the weapon he is used. Do you agree with him? If you cook Chinese food, not in Chinese way, but in a way as you did at home in western style, you let your friend taste it. Your friends said that the Chinese food is not good. Do you agree with them? Don’t try to omit to tell your friends that your “Chinese” food is not CHINESE food! If we are realistic and neutral in compare some things, we must compare them in their original forms, shape, functions, and so on. Finally, if you really want to understand the Chinese Herbal Medicine, you have to first clear you mind and be realistic to what you know and what you have not known. The Chinese Herbal Medicine might be new to you and you may bring a critical attitude to it. Before you make any comments on it, I suggest you to prepare yourself first. Just as if you have to quiet down your mind first before you are going to a read a book. If you are in a angry motion, how can you “read” the book in your mind? (1). You have to admit that what you, and we human being, only know little about the nature, as well as our body. Therefore, we should, and had better to keep our enseutheastic attitude to learn new things. Don’t let your current knowledge block your learning to new thing. We should ask us the question, why the Traditional Chinese Medicine can exist in the other side of the earth for more than five thousands of years? The readers should also know that in April 12007, the Chinese government announced that it will use the Traditional Chinese Medicine as its main medical and health force to solve the healthcare crisis nowadays in China, after having trying the conventional medicine for more than 50 years there! (2). In the world, many things can show us different information if we change the view or direction to see it. Here is a famous picture (Fig. 1). If you pay attention to the white color, you see it as a wine cup. 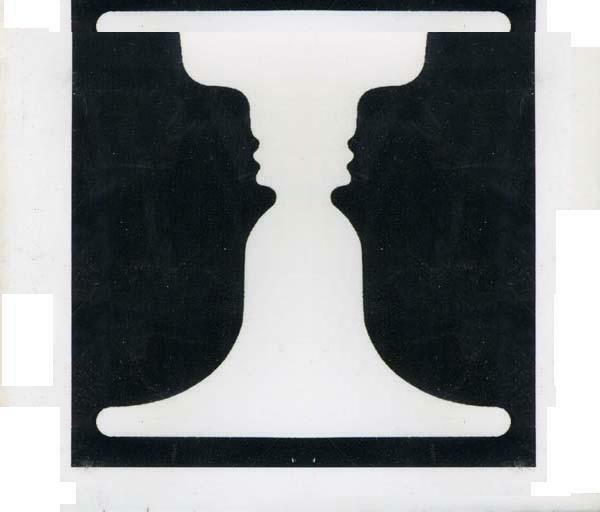 But if you pay attention to the black color, you can see it as the lateral faces of two people! Traditional Chinese Medicine doesn’t go deep to the cells and genes, but it focus more on the body function. On the other side, the conventional medicine focus on the structure of the body to the cells and gene levels, but it still missed the meridian system. Even today, it is still difficult for the conventional medicine to understand many phenomenon linked to the meridians in the body. What you see from the Fig. 1? I asked one of my friends. She said that she can see the lateral side of a head. 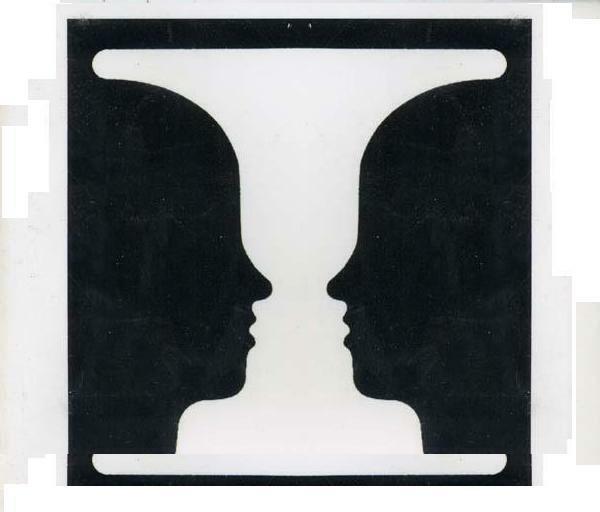 Oh, she added, the lateral faces of two people! I remind that what she can see if she looks at the white part of the picture. She said, yes, it is a stool or a flower container. Now, what you can “see” from the Fig. 1? When you turn to see the Fig. 2. Can you “see” the face of a person? Or, you may only be able to image a container or a stool. Do you? The view of the first picture suggests that the feeling of a man to a given thing is affected by his attention to the picture. Pay attention to the black part or the white part gives different imaging of the picture. You may not see a plan in the sky if you did not pay attention to see it. What you did not see doesn’t mean it does not exist! The second picture suggests us that for the same thing, if we view it in a different direction, the result could dramatically be different! This the truth for the conventional medical system and the Traditional Chinese medicine. Fig. 3, is the water-color painting of Chinese style. It leaves empty space in the painting. You can still image to know that the empty space means clouds or fog. You can even image that there could be something behind of the fog. Fig. 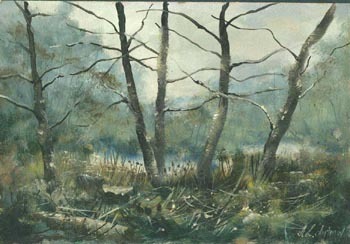 4 is the typical western style oil painting. The oils are painted on all parts of the painting paper. Everywhere! Traditional Chinese medicine pay more attention to the overall functions of the body, whereas the western medicine, the detail of the body. Once we come into detail we may lose the whole. This is just the case. In above picture, do we need to know the exact chemical contents of each color spot? With all of these mind preparations, you are ready to UNDERSTAND the Traditional Chinese medicine.